(Top) Britnee Kinard's husband, Hamilton, has a brain injury and PTSD. She got kicked off the program by the Charleston VA in 2014. (Left) Hamilton's daily medication. 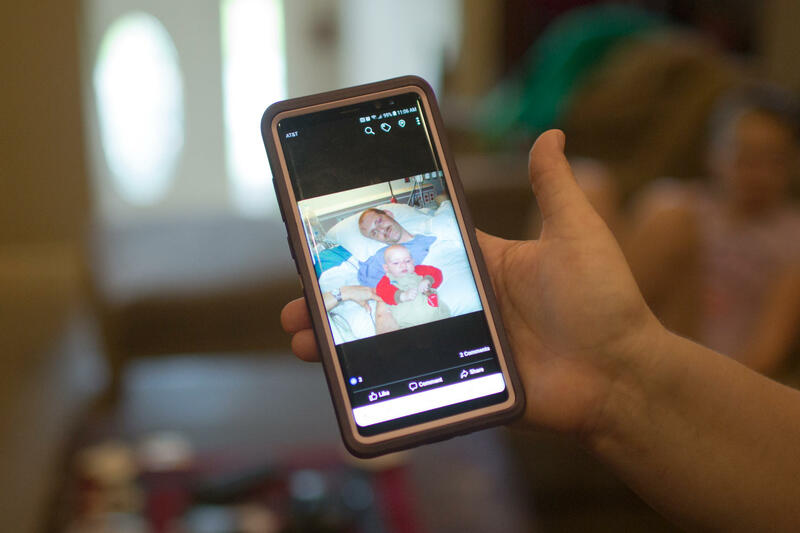 (Right) His uniform in the closet at their home in Richmond Hill, Ga.
Jenn Wilmot shows a picture of George after his accident. He was thrown free from the gunner's turret as his Humvee tumbled off a cliff in Iraq. He survived, but with a brain injury, PTSD and a left arm that still looks sewn-on. George Wilmot gets lost easily, forgets things — like a pot on the stove — and sometimes falls down without warning. His wife, Jenn, hasn't been able to work outside the home because taking care of George is a full-time job. 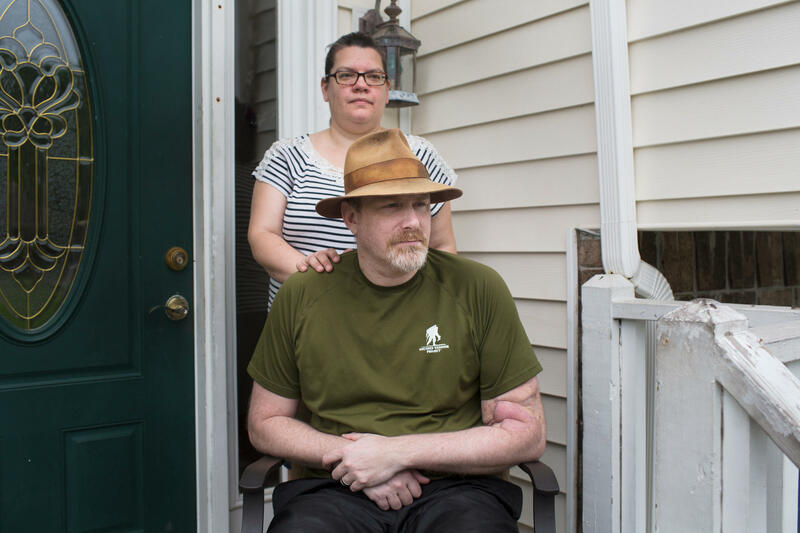 After two years in the VA's Program of Comprehensive Assistance for Family Caregivers, the Wilmots were dropped even though they say George's condition hasn't improved. Jenn Wilmot says the Charleston, S.C., VA encouraged her to reapply, and then rejected her. Hamilton Kinard can't use his legs some days and needs help with bathing and toileting. In the early days of the Iraq War, troops were riding around in Humvees with almost no armor on them. There was a scandal about it, and within a few years the trucks got up-armored with thick steel plates, which solved one problem but created another. "Some genius thought about up-armoring. Good! But they didn't do anything with the brake systems," says George Wilmot, who was riding an armored Humvee in 2009, leaving a hilltop base in Mosul. "We took some small arms fire ... my driver took us off a cliff," says Wilmot. Wilmot was thrown free from the gunner's turret as the Humvee tumbled. He survived, but with a brain injury, post-traumatic stress disorder and a left arm that still looks sewn-on. The Department of Veterans Affairs rates him 100 percent disabled. George gets lost easily, forgets things — like a pot on the stove — and he falls down hard sometimes, without warning. His wife, Jenn, hasn't been able to work outside the home because caring for George is a full-time job. "If he knows I'm going somewhere and I'm not going to be here, he'll hang out in the bedroom because it's a short distance right to the bathroom," she says. "That's not how you should live, though." The Department of Veterans Affairs' Program of Comprehensive Assistance for Family Caregivers seemed a perfect fit for the Wilmots. It pays a stipend to family members or friends of a post-Sept. 11 veteran — often a wife or mother — who provide care. But after two years on the program, the Wilmots were dropped, even though they say George's condition hasn't improved. NPR spoke with the Wilmots last year for a report that found some VAs across the country were dropping caregivers off the program while most other VAs were adding. After that report, the VA reviewed the program and made several changes to improve and standardize it. But a year later, most of those VAs are still shedding caregivers. And many who were dropped before the improvements say they can't get back on, even though they say their veterans still badly need assistance. The stipend ranges from a a few hundred to a couple of thousand dollars a month depending on the severity of the disability and the market rate for caregivers. Vets love the program not only for the stipend, but also for the recognition of the care their families provide. One study estimated the care to be worth billions of dollars. The numbers looked arbitrary from city to city, which was bad luck for the Wilmots — they go to the Charleston, S.C., VA, which dropped 94 percent of its caregivers in three years. After the NPR report last year, the VA briefly paused all revocations — that is, it stopped kicking people off the program — and carried out a strategic review. Meg Kabat, who directs the program, says the pause allowed the VA to better oversee and standardize it. "We were able to issue a directive. It's on the VA website, so it's there for caregivers, veterans, advocates — one policy that is followed by every medical center across the country," says Kabat. 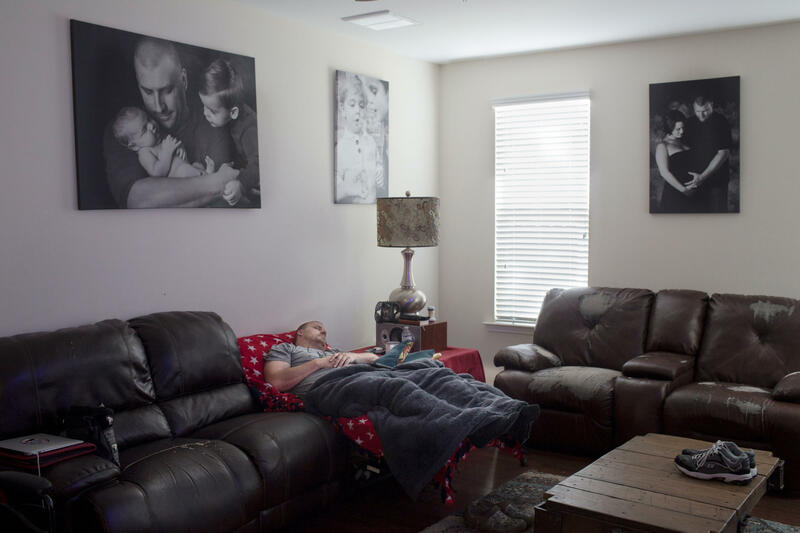 After the pause, veteran families like the Wilmots thought the program would be fixed. 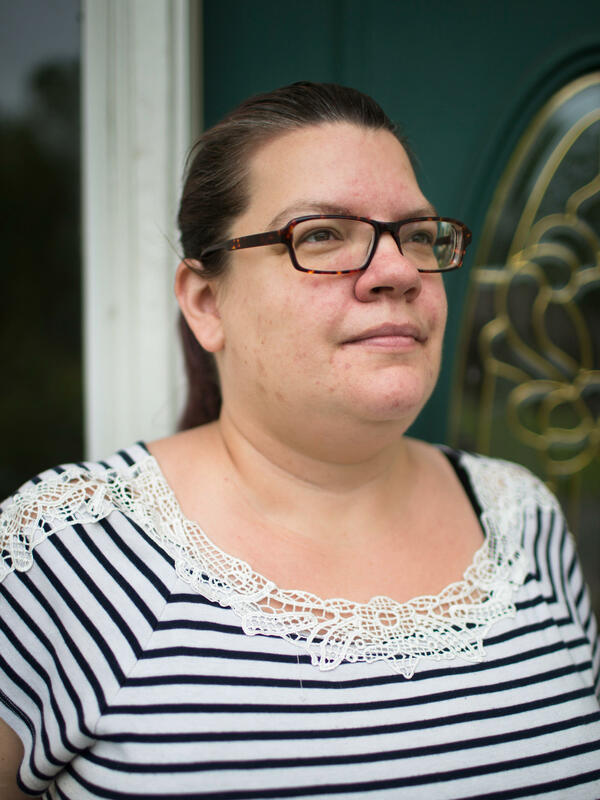 Jenn Wilmot says the Charleston VA encouraged her to reapply, and then rejected her. Current VA statistics suggest the Wilmots aren't alone — the Charleston, S.C., VA is still down 93 percent from 2014. There are only 13 approved caregivers on the program there. The South Texas VA had 342 in 2014. Last year it was down to 177. Now there are only 40. Northern Arizona kept cutting; so did Puget Sound. Fayetteville, N.C., had 570 caregivers in 2014; 350 have been cut, including Ashley Sitorius and her husband, William. Ashley Sitorius says she knew during William's deployments to Iraq and Afghanistan that he could come home injured. "I thought, 'He's serving our country, he'll most definitely be taken care of,' " says Ashley. She was kicked off the program in 2015. "They just said he wasn't clinically eligible anymore and he didn't need a caregiver. And honestly, he's gotten worse. I wish he was better," she says. Last year, after the program pause, Sitorius applied again and got rejected. She appealed to the regional office and got rejected again in March of this year. Kabat, the program's director, says some VAs are still correcting the error of letting way too many people in at the beginning. And she says the demographics vary from state to state, and that the number of new disabled veterans has dropped as the wars in Afghanistan and the Middle East have wound down. "It's not surprising to me that there's a group of veterans who are participating in the program for a period of time and then are discharged," says Kabat. Once caregivers get in the program they start using a lot of other VA services, too. Many vets improve and graduate out — which is the goal, says Kabat. But for some veterans that goal may be out of reach. Britnee Kinard takes care of her husband, Hamilton. He has a brain injury and PTSD, among other things. She got kicked off the program by the Charleston VA in 2014. She sees her husband deteriorating. He needs help with bathing and toileting. She's dreading the day when she'll have to take away his car keys. "I try my hardest not to pull his, quote, man-card," says Kinard. "I want him to be as independent as possible. But the reality of it is, the more his health progresses, the less independent he is and I'm trying not to take it from him." The VA says it's still standardizing the boards that evaluate applications, and last year it audited hundreds of the cases of people removed. But some of those caregivers have been on the phone with their senators. Last month, Republican Dean Heller of Nevada and Democrat Bob Casey of Pennsylvania sent a letter to the VA asking that all of the caregivers who were kicked off before the program was revised last year get a second look. "The veterans and their caregivers deserve to have their cases reviewed and use the same improved procedures," says Casey. "Caregivers should not be treated differently because their case happened to come up for review a week before or a week after the time when the VA froze discharges." The VA's Acting Secretary Robert Wilkie responded that the VA is working to improve the clinical appeals process so veterans and their caregivers can get back in. Sitting with her disabled husband, George, Jenn Wilmot says her last appeal was exhausting. "Does he need it?" she says. "Oh yeah, I know he does. But it's just too tiring to fight." She might be up to it, Wilmot says, if she weren't working full time taking care of her veteran.